Happy to meet you, I am Jonas, Engineer in Aeronautic and HMI. I am currently PhD student in Neuroergonomics. 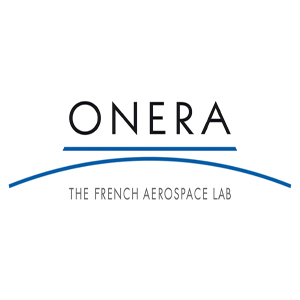 I started my PhD in September with the ONERA (French national aerospace research center) in the south of France. Here weather is hot, wind is strong and so is our will to change the world for the best. If my profile interests you or if you have any question, do not hesitate to contact me, I will always feel honored by your interest! "Leonardo Da Vinci combined art and science and aesthetics and engineering, that kind of unity is needed once again." 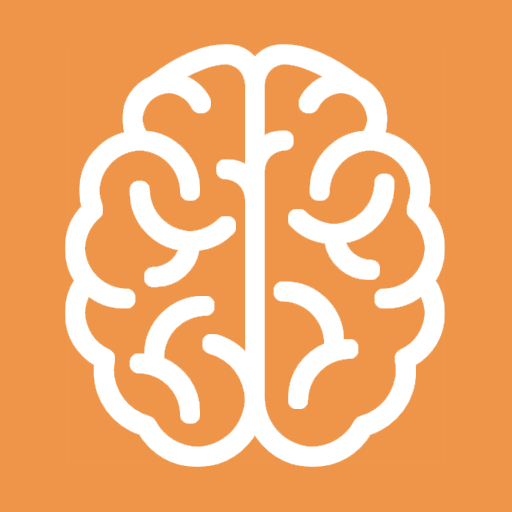 Neuroergonomics is a young field that aims to use neurophysiological factors to study ergonomics. Far from being another trend, crossing those field allows us to explore new aspects of human factors. I firmly believe that all is interaction. From working on your computer to reading a map - and even cursing your shower because it is too hot - we all interact with systems in our daily life. I have liked planes since I was a kid, and being on the other side made me love all aeronautic domain. Designing systems that match safety and security is a tough goal - and a reward when achieved. After my French A-level, I decided to go to CPGE training (tough preparation to competitive national exam) in maths and physics. I saw the extent of human knwoledge, and how small I was. I decided to join the ENAC (French National Aviation University), following my interest for planes. In there, I discovered many different areas within aviation - UAVs, ATM and airports. I found also a passion for computer science which I developped thanks to school and personal projects. In order to acquire some experience within Human Machine Interaction, I joined the Interactive Informatics Laboratory of ENAC. I had the honor of working with skillful scientists who taught me a lot. I found there my conviction that "everyhing is interaction", thanks to my tutor Stephane Chatty. 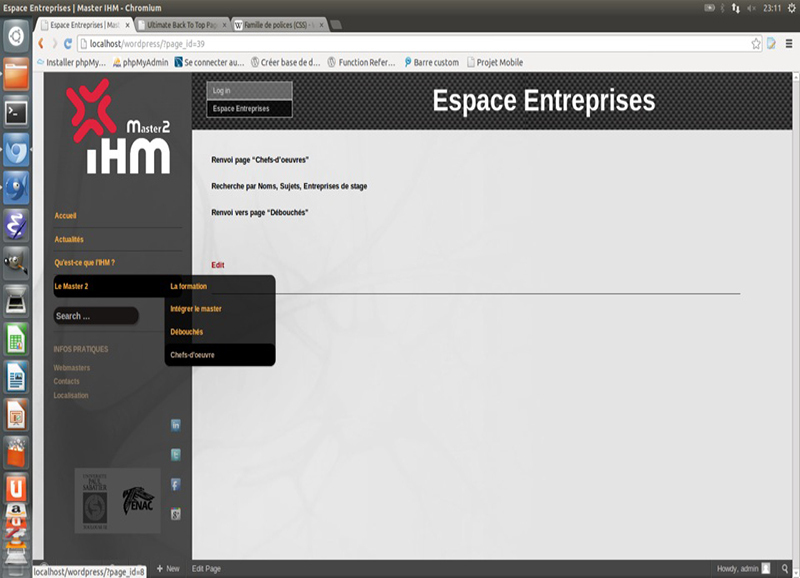 I decided to specialize in HMI by following the HMI Master, the only HMI schooling in France focusing on interaction developement. I studied design, prototyping and met a lot of people amazingly inspiring. 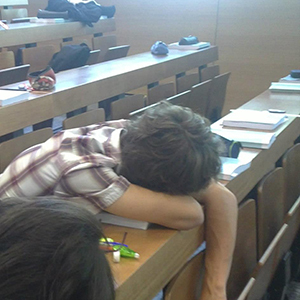 To discover new cultures, I decided to do my last internship abroad. I found in Frequentis the perfect subject to put into practice all my schooling in ATM and HMI. All this was even more interesting in the wonderful city of Vienna. After much thought I decided that it was the best choice considering my ambition to adapt machines to humans (and not the contrary) and my will to teach. Questions, remarks, proposals: do not hesitate, as I will always answer whatever you want to discuss about. I normally answer within two days, except in emergency situations (e.g. holidays). Special thanks to Cassandre Gouraud and Simon Prieul for their help. This website was developed using Open Classroom's Bootstrap awesome tutorial, Bootstraps unbelievable starting themes and the necessary Font Awesome. 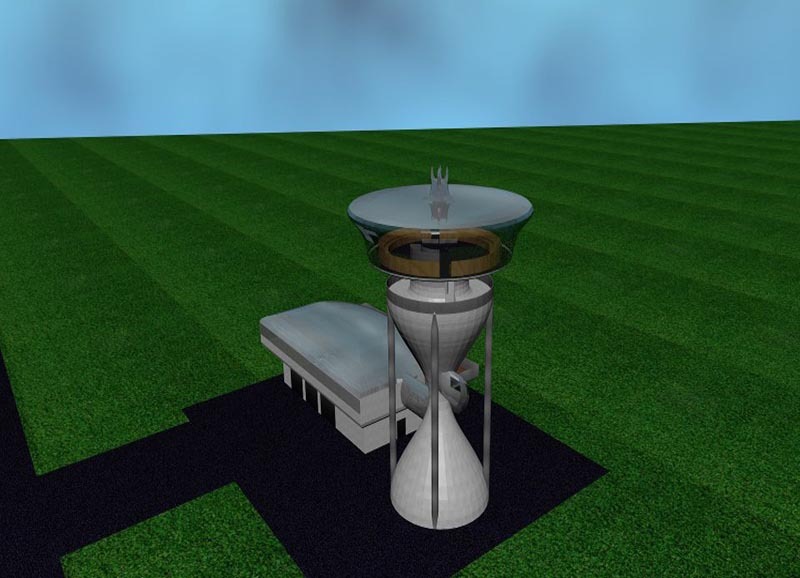 Remote Tower concept is one of the key innovation topics in ATC. It is addressing cost issues at small and regional airports by applying a new operation concept and operate such airports from a remote tower centre. The main idea of such concept is to share controller resources between airports and enable controller to operate multiple airports in sequence or parallel mode. 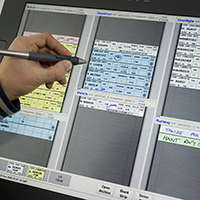 In a first step the existing user interface concept which was developed for single remote tower shall be used as a baseline and shall be extended to enable switching mode operations between different remote airports from one working position. Therefore operational reference scenarios should be defined (by using SESAR OPS Concept and inputs from other ANSPs). Based on this reference scenarios an HMI mockup shall be created to enable validation of these scenarios. In an iterative process the concept shall be refined and feedback cycles from internal and external experts should be applied. R, an open source statistical processing software widely used, has a significant number of extensions to handle any data and use all the latest statistical tools, but offers only limited usability and austere Human-Machine Interface. The "R ++, the next step" project aims to build on the power and flexibility R to create a language similar but modernized (object concepts, parallelization, Big Data). In addition to the language, the R++ project aims to provide a software directly supported on the eponymous language, proposing a usable GUI, modern and pleasant. 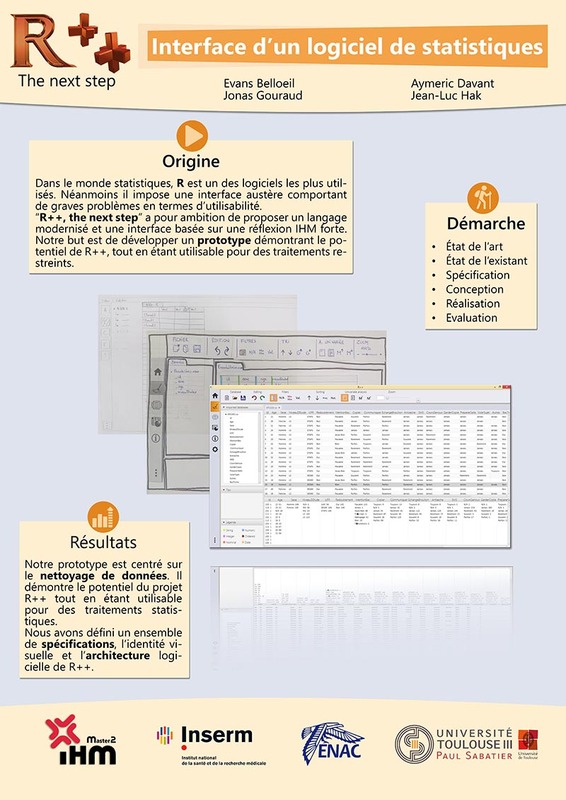 Our role in this project was to design the interface of R++ software. Meetings with users gave us a complete understanding of the needs of researchers in statistics. Building on this solid foundation, we have listed a set of specifications covering all the needs of users and the client. We then designed a series of paper prototypes through brainstorming, quickly followed by a second integrating the graphics we developed. These prototypes were used to conduct usability tests. This done, we could think of the architecture of our software to program the last in the chosen language (Java accompanied by JavaFX graphics library). The project was divided into three parts. 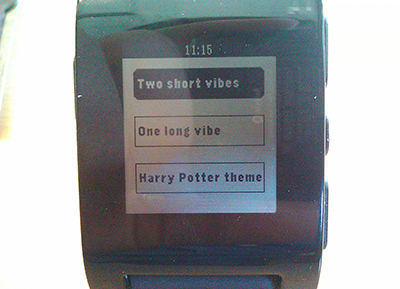 First it was necessary to understand how the Pebble - chosen smartwatch - was functioning, and how to program with the Pebble library. 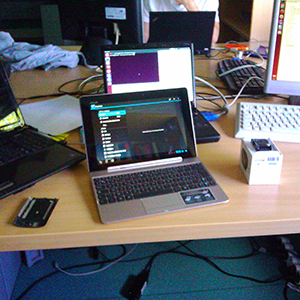 The second part was to develop a compiler between a new interface oriented language - Djnn - and the Pebble library. Finally, the final part was to understand how smartwatches could be used to warn pilots during the flight. 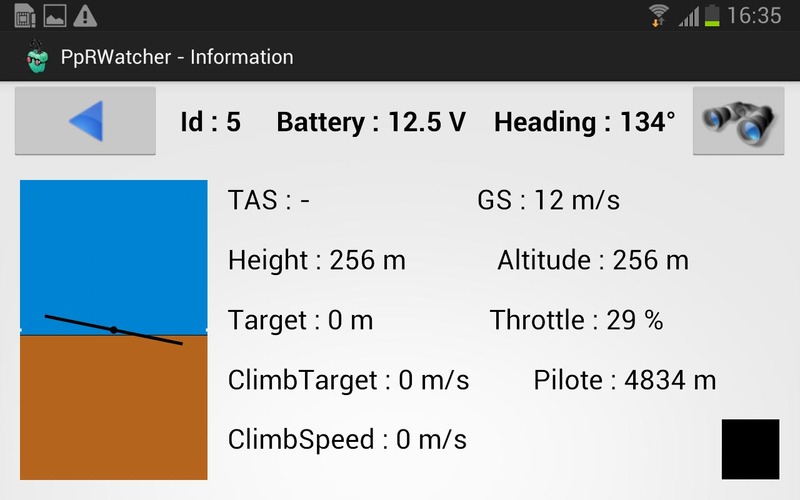 Conception and developement of a smartphone app for UAV safety pilot. During the flight of a civilian UAV, safety operator is needed to regain control if an incident happens. This operator can sometimes be embarrassed to see the drone : masking object, UAV far away... This problem is a safety issue, for the drone and for people around. Within Paparazzi UAV project, we designed a smartphone application to locate the drone and display information necessary for the decision. After gathering pilot needs, we decided to structure our app in 3 screens. First one allows overall view of UAVs, following Ben Shneidermann's creed "Overview first". 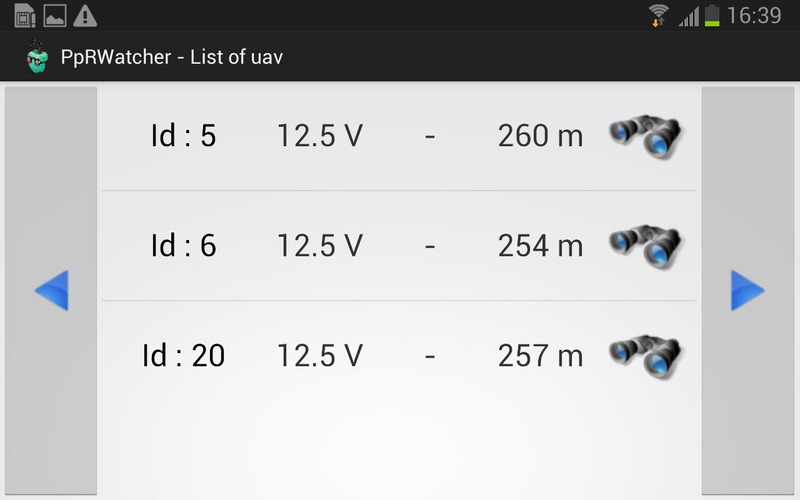 The second displays smartphone's camera view with enhanced features showing UAV, to help locate them. The last screen sum up all flight data in a form close to Primary Flight Display system (used in all commercial airplanes). I did this project with Juliette Rambourg, make sure to check her awesome website too ! As practical for ADA language schooling, We developed a turn based race game with a user interface and keyboard controls. 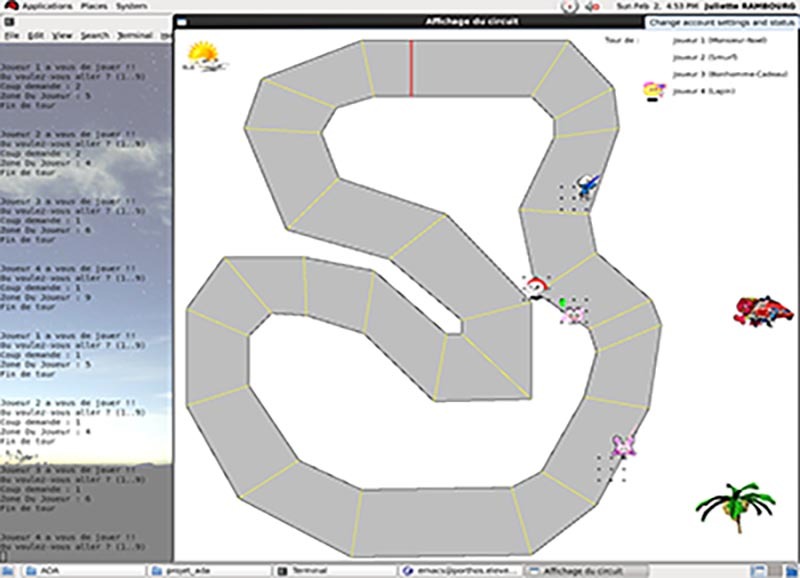 We also programmed an AI with the Negamax algorithm, so that up to 8 human and computer players could play together. 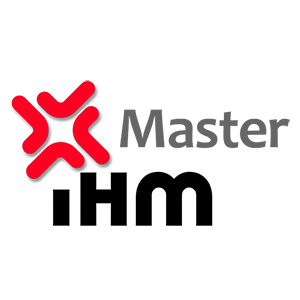 Design and development of a new version of ENAC Master IHM. The HMI Master of ENAC and Paul Sabatier University is the only Master in France providing HMI schooling although being development oriented. It is well-known nationally and abroad (as example it is the first result on Google). This schooling has already a website up to date. However, acording to the deputy head Yannick Jestin, maintenance is difficult and design could be improved. He proposed us to conduct a revision of the website to better reflect the expectations of users and support the visibility of the master. How to integrate a private spaceport into air traffic flow? The Student Aerospace Challenge originates from the will of the aerospace industry and the student associations to tighten their ties by conducting a large scale federating project. The Challenge proposed by the ACE allows the students to participate to the study of a suborbital spaceplane. This is a reusable vehicle which will reach Mach 3.5 and 100 km of altitude, the edge of space. The study of different aspects of the VSH project is proposed: propulsion, avionics, maintenance, legal aspects, etc. The students will work in close collaboration with the aerospace industry and are asked to produce innovating solutions. The students selected for the Student Aerospace Challenge will enjoy the privilege of participating to a large scale project which takes part in the present evolution of aerospace systems. This project exists since 2011 thanks to companies like Dassault, Airbus, Thales, Cosmica Spacelines and many others. In this context, we developped the working package dedicated to airport and spaceport questions. We had firstly to study a suborbital flight model to define its impact on air traffic flow. On a second part, we listed all possible changes needed for a spaceport to operate suborbital spacecrafts (regulation, facilities, public reception). Thanks to those studies, we were able to search for an French airport likely to host such spaceport. We finally designed in 3D all facilities needed in a perfect scenario.